Once you’re living together, every couple finds that certain jobs begin falling to one of them or the other. They’re assigned according to gender roles, or your schedules, or because one person (Christina) has decided it’s “gross”. Spider removal. Bathroom cleaning. Spray painting. She doesn’t always give me credit (I’m fine with it), but if something needs to be spray painted, it’s on me. So I’m starting to become an expert. We’ve used spray paint on a lot of our projects. It sounds easy. It even sounds fun. But we’ve discovered that it’s not always practical. So if something needs a fresh coat of paint, you’ve got to think about more than just the color and decide how it’s going from the can to the project. Smooth finish – Spray paint leaves no brush marks, and if you do it right—repeated light coats—it won’t run either. For this lamp, we needed even, nearly undetectable coverage, so spraying it was the way to go. Funky sh apes — Spray paint is a lifesaver for any shape you’ll have a hard time wrapping a brush around. 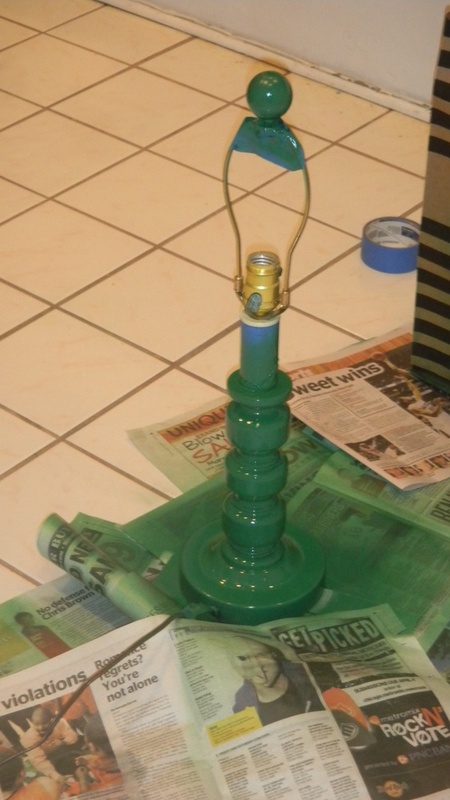 Painting that lamp would have been a big ol’ mess without it. Time — Spray paint dries crazy-fast, so even though you’re laying down several coats, you’ve finished a dresser before Christina can stitch a pillow. Unless, of course, you run out and have to dash to the suburbs to get more. Cost of Coverage — Here’s where spray paint loses a bit of its glossy finish. This dresser took four full cans of spray paint, at about $3.50 a pop. For that cost, you’d have conventional paint left for the rest of the bedroom set, and you could throw your brushes and rollers away when you’re done. Space — If, like us, you live in an apartment, finding a place to spray paint can be a pain. We’re lucky to have access to a garage. Otherwise, you could put down enough newspaper to housebreak a racehorse, and you’ll still scrubbing over-spray off your kitchen tile (and the wall, and the dog’s bowl) with a Magic Eraser. Not to mention the fumes. Even though spray painting sounds easy, and even though cleaning brushes is a drag, take the time to figure out what’s really right for the project. And, if you skip the spray paint, maybe you can even get some help from your better half. Nice guest post! I didn’t realize you spray painted the dresser. Definitely, brushing would have been the way to go. If you get a really good brush and decent paint, there shouldn’t even be any brush stroke marks. You forgot to mention spray painting takes talent and patience. You can’t get too close or you have drip marks and getting even coverage (no thin spots) is tricky. Kudos to a great job!!! Thanks, Cindy! I think he did a great job too! 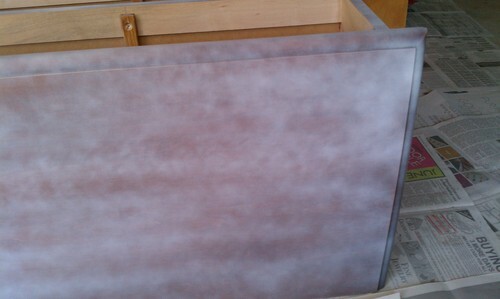 Next time it’s a big paint job though, like the dresser and eventually the pallet, we’ll definitely use regular paint. We’ll stick to spray when it’s a small item, or one with weird lines, like our office lamp.